It's not a secret that I'm biased in favor of visualizations that are clear and avoid capricious special effects. The priority in visualization design is to enable the discovery of interesting stories that lurk behind the complexity of data and information, and that is regardless of the context of the graphic. You can certainly sacrifice a bit of clarity and bend or break the rules if the payoff is great (a substantial increase in visual appeal, for instance,) but that's not a blank check. 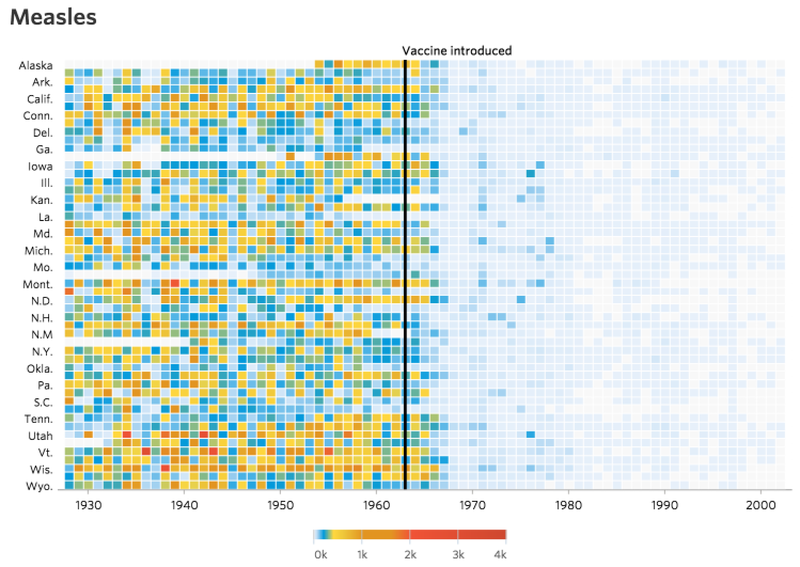 Anyway, the previous lines are just an excuse to recommend two very recent projects by The Wall Street Journal, Track National Unemployment, Job Gains and Job Losses, and Battling Infectious Diseases in the 20th Century: The Impact of Vaccines. Both illustrate how to achieve clarity and beauty, I believe. I'm teaching a class in 30 minutes, and I'm incorporating them to my slides right now.